This recipe is from my friend, Jeanne, and these taste every bit as crunchy-licious as they look in this picture! Remember that the oil you use to fry in, and the temperature you cook in makes a BIG difference. You’ll also want to be careful not to go over the smoke point no matter what oil you’re using. If you hit the smoke point, then all the benefits of your healthy oil will be lost and the cancer-causing free-radicals could take over. At this kitchen gadgets post you can read about my new kitchen appliances that prevent the oil from going over the smoke point. It was just too tricky to keep it the right temp when cooking in a big pan on the stove. I ended up throwing out some of my precious tallow after the last time we made fried food because the oil was smoking like crazy and I was all freaked out about it. UPDATE: I just learned about a way to ferment potatoes to reduce the formation of acrylamides! Just slice them and soak the night before with about 1/2 cup of whey or and enough filtered water to cover. The next day, drain and continue with recipe. Easy! It just takes thinking ahead a little. Thank you, Jeanne, for this recipe! Be sure to try this with my homemade french onion dip. Beef tallow, enough to fill your deep fryer about half full — You could also use pastured lard! Clean and cut off the bad spots off your potatoes. Use a Mandolin to slice the potatoes so you can get thin, uniform chips. Or sometimes I'll use the shredder attachment on my Bosch! Dry well on kitchen towels. Jeanne did each one individually, but I just laid them on this big cheesecloth, then laid another one over the top and patted it down. In the meantime bring your cooking oil to 350*. 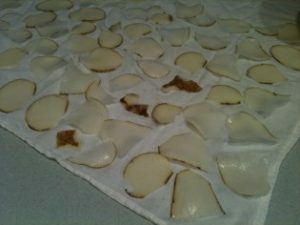 Fry potato chips in small batches, flip part-way through as needed and cook until desired color, just past golden brown. Drain well and shake on sea salt. Keep hot in a 325* oven until it’s time to serve. Bring oil back up to 350* before cooking the next batch of potato chips. Try shaking on some spices to make flavored potato chips — does anyone have good suggestions for this? 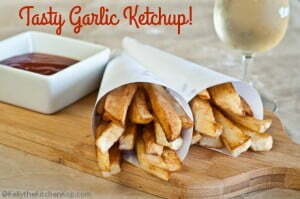 Now that you know how to make homemade potato chips, try making this garlic ketchup recipe to go with them! I’d love to try this using blue potatoes and coconut oil! Have you seen this post about what I use to fry in? Would palm shortening work for frying? I guess I should check the smoke point. I’m a vegetarian, so beef tallow isn’t an option. Yes, check the smoke point on that one or also you could check the refined coconut oil. Those look delicious! I know the family would love them. Robin, I think Cheeseslave has a good recipe for corn tortillas on her site? Raine-I make homemade tortilla chips (and tostadas and taco shells) all the time but have so far only used store-bought corn tortillas (I do try to find a good-quality Mexican brand). I do want to make my own but when I tried in the past, it turned into a huge mess (I tried at least a couple times!) and never really did end up with actual tortillas! I keep thinking that trying it with a tortillas press might help…any tips on that? Anyway, when frying corn tortillas for chips, I have had them turn out chewy many times in the past and finally found that the main reason was from tortillas that were too thick. Try making the tortillas as thin as possible before cutting and frying. Another trick is also to maybe let them dry out a little before frying. I always used to use canola oil until I learned it wasn’t so healthy. So, I recently found some lard, and after using that several times to fry the chips, I have decided that LARD ROCKS for frying chips-they turn out crispier and not oily at all! I’ve never actually used a thermometer though for frying, so I have no idea what the temp is usually at (I just eyeball it), but if it’s not hot enough, they’ll take too long to cook and absorb too much oil. I love how I’m learning to make the foods we’re used to with a healthy twist. Thank you for sharing this! It’s good that you brought this up! Apparently this applies for ANY starch cooked in ANY way except boiling (boiling is fine). Baking and roasting would have the same result, and especially when browning anything…just the way I like it, too, dang it! So it sounds like our body knows to store it where it won’t be as harmful to us, but this basically is a GREAT reminder to me (AGAIN!) that we should only eat a LIMITED amount of starches in our diets anyway, especially the cooked ones, and that these potato chips aren’t as guilt-free as I’d hoped. This is why I tell people all the time, don’t just listen to what I say, there’s too much I don’t know! Hate to sound like a party pooper here, but what about acrylamides? I’m pretty sure that they are a result of cooking starch at high heat and / or pressure. They are found in chips, cereals etc. I’m all for the coconut oil or lard, its not about the fat. Just wondering if oven roasted potatoes might be lower in acrylamides than chips. As long as you’re getting enough animal fats otherwise I think that’s fine as long as you double check what the smoke point is (link above) for olive oil and don’t go over that. Sorry I don’t have time to go look that up right now…gotta run! question: I was going to bake mine w/ olive oil- do you have any thoughts on this? I want to make sure they are crispy enough….Thanks! I’m not a big chip person, but thanks for the great post! Raine, you DON’T know, that’s the problem and the reason I bought fryers because those keep the temp just right and I don’t have to worry. Here’s another question I wonder if anyone knows the answer to – if you are frying on the stove top, how do you know what temperatures the various settings are at? I’ve tried looking this up many times and cannot get a consistent answer. I don’t normally cook over medium for anything I prepare -except when I am bringing something to a boil and then turn down to simmer. And in my oven, I rarely go over 375. I have been making my coconut fries in the oven at about that temp, sometimes lower. We do this off and on, but, we like to use sweet potatos as a special treat. Shake on salt and pepper for some extra yummy! If you do want to try using a shallow pan, use cast iron, and keep another of the same size next to the stove. You can pop that over the pan if a fire were to ever occur. A cookie sheet works just as well. Using a lid does not work all that well, as they don’t have a handle to keep you from getting burned. Raine, I don’t know how long to cook the tortilla chips exactly, but Mmmm, they’re good. Just keep an eye on them and pull one out to test every so often to see if it’s as crispy as you like it. 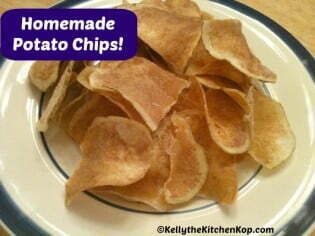 I have been wanting to make homemade potato chips, but just have not gotten around to them yet. I have been making home-made french fries though, in the oven with coconut oil and they are absolutely fantastic! I’ll be posting that recipe soon. It’s a big favorite here in our house. I do have tallow, but I’m saving it for recipes where tallow is really a necessary item because it’s expensive. Coconut oil can be expensive too, but the tallow costs more – I get mine from USWM. I also made home-made corn tortillas the other night with coconut oil too. They were delicious, but my husband said I should not have cooked them quite as long as I did – they came out sort of tough to chew. Has anyone made tortilla chips with healthy oil before, and if so, how long does it take to cook them so they are crispy but not too tough? Can you fry these in a shallow skillet? I’m just afraid of the mess it will make – even with my splatter screen. I think I might try it with sweet potatoes and the coconut oil. Thanks for this recipe! I’m a kitchen experimenter so will definitely try this to keep it healthier AND save money. Thanks also for the recommendations on healthier oils! I too love fried foods (a little too much)! No fair, Kelly. I just bought potatoes and here you are tempting me to go off my milk diet. 😉 Let me add this to the list of delicious real foods I want to eat in 22 days when I’m done. These look awesome, can’t wait to try them! i was wondering if baking would work too, like NHG mentioned? Hey guys, I don’t know about deep frying in coconut oil. On the chart in the link above on smoke points it says that the temp for unrefined is 350*, and I deep fry between 350* and 375*. The refined coco oil might be good, though – that smoke point says 450* and it would go better with more foods since it has no flavor or smell. You could bake in the unrefined though, as long as you don’t set the temp for higher than 350*. What else to do with tallow? Darn; I had a mandolin for about 5 years and used it once. Guess I shouldn’t have just given it away to my out-of town sister-in-law!! Kelly, what are your comments to using coconut oil instead of the tallow? Score! Real chips! Thanks for sharing, I’ve been thinking about giving these a try. I use coconut oil with great success in all my frying (which isn’t that much) but I made chips last week with nutiva CO and they came out great. So, for those without tallow it’s probably good substitute. I put garlic and chipotle along with salt on mine when they were just out of the oil, delicious! I’ve also used a salad spinner for drying the slices with great success….I don’t have the counter space to lay them out on towels. Thanks Kelly! I haven’t been a big fan of potato chips since I was a kid and didn’t know any better. 🙂 But these sound great. I wonder would baking be an easier option to avoid going over the smoke point and perhaps using less oil? I too would be curious how coconut oil would work since I don’t have any beef tallow on hand. 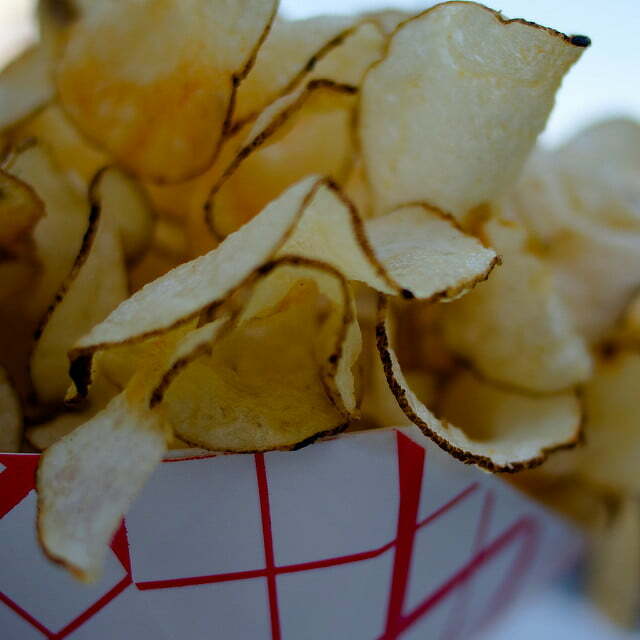 Those chips look so good! I wish I hadn’t looked at the picture right before lunch — now nothing will compare 🙂 We’ll try making these. Would coconut oil work instead of tallow? kelly, can you reuse the tallow once you’ve fried in it? i’m a southern girl from a farming family so fried okra, chicken fried steak, fried cornbread and well, fried everything is what i grew up on. but since we’ve made the switch to healthy oils i don’t fry as much because the amount of oil needed is cost prohibitive and i like you get freaky about oil reaching it’s smoke point. if you can reuse, how do you store it between uses, and what else do you use your tallow for. Love it! I don’t have tallow yet so I used coconut oil (but plan to buy tallow soon). I need a mandolin slicer! Yum they look great! I’m not sure if i’ve ever had beef tallow in my life (except of course IN beef). Then again certain donut shops here in oz do use it I beleive and some other fast food places. I’m not sure where I would get beef tallow but I reckon coconut oil would be a great substitute!